This article is about the world. You may be looking for the musical track. Deep Jungle is a world that appears in Kingdom Hearts, based on the 1999 Disney film, Tarzan. It is home to Tarzan and his ape tribe, as well as a set of explorers trying to learn more about the gorillas. 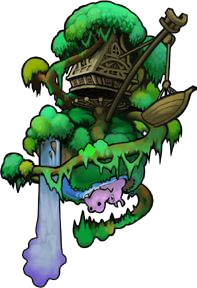 Deep Jungle is the only Disney world from the original Kingdom Hearts that does not appear in Kingdom Hearts Chain of Memories, any other game, or the manga adaption. This is most likely due to the estate of Edgar Rice Burroughs still holding copyrights to the Tarzan character and later Tarzan books, with Square Enix remaining unable to secure the rights to use them. Sora enters Deep Jungle alone and at the Tree House (樹上の家, Jujō no Ie? ), where he battles Sabor and meets up with Tarzan. Jumping down from the netting below the house sends Sora into the Tunnel (大穴, Ōana?, lit. "Large Hole"), where he can either use the save point, access the Treetop (最上層, Sai Jōsō?, lit. "Top Layer") and Climbing Trees (ジャングル：奥地の大樹, Janguru: Okuchi no Taiju?, lit. "Jungle: Large Tree's Interior") to head back to the Tree House, or jump into the log and begin the Jungle Slider mini-game. Jungle Slider takes the party to the Camp (キャンプ, Kyanpu? ), where at the Tent (キャンプ：テント, Kyanpu: Tento?, lit. "Camp: Tent") within the party can meet with Jane Porter and use the save point within. The east exit from the camp by the stove and experiment table leads to the Hippos' Lagoon (ジャングル：カバの沼, Janguru: Kaba no Numa?, lit. "Jungle: Hippo Swamp"), which can only be traversed with swimming, good timing, and well-aimed jumps. Heading across the Lagoon takes the party to two areas, Vines (巨木群, Kyoboku-gun?, lit. "Large Trees") and Vines 2 (ジャングル：入口, Janguru: Iriguchi?, lit. "Jungle: Entrance"), which are home to the Vine Swinging mini-game. Vines 2 in turn leads back to the Climbing Trees. Heading out the north entrance of the Camp by the clothesline takes the group to the Bamboo Thicket (竹やぶ, Takeyabu? ), and continuing through the Thicket leads to the Cliff (岩壁, Ganpeki?). After the last battle, Sora and his party gain access to the Waterfall Cavern (滝の裏, Taki no Ura?, lit. "Behind the Waterfall"). Sora and party are required to climb up the cavern. At the top of the cavern is an entrance to the Cavern of Hearts (こころの洞窟, Kokoro no Dōkutsu? ), the supposed heart of Deep Jungle, where the sound of the waterfalls echo and where the Keyhole is sealed. Notice that in the Climbing Trees area of this world, there is a different means of moving throughout the area called Vine Swinging. This is simply the process of jumping from one vine to the other to get from platform to platform. In the Gummi Ship, Donald and Sora argue on whether or not to land in Deep Jungle. Sora says that Kairi and Riku may be there, but Donald says that the King wouldn't be in "a backwater place" like it, so they should move on. Sora pleads with Donald to land so they could at least check, but when Donald refuses. As a result, Sora ends up fighting with him over the controls, crashing the Gummi Ship on the world itself, and Sora, Donald and Goofy are separated afterwards. Sora falls into a treehouse, where he is attacked by Sabor, but is saved by Tarzan. He is then brought to a tent by Tarzan, where he meets Jane and Clayton, who found Donald and Goofy. They had found a Gummi block, assuming that the King might be there. Sora wants to know if Tarzan has seen Kairi and Riku, so they collect some slides for Jane to help communicate with him. One of the slides shows Hollow Bastion, which Sora vaguely recognizes; although he does not understand how, since he has never left Destiny Islands (his déjà vu is due to Kairi's heart sleeping within him). Sora is asked by Jane if he wants to meet the gorillas and he agrees, hoping they know the location of Riku and Kairi. Together with Donald, Goofy, Clayton, and Tarzan, he meets Kerchak and Kala. Kerchak is not pleased with Tarzan potentially revealing the secret nesting grounds of the gorillas, and he sends him away. Meanwhile, Clayton goes hunting for gorillas. Upon arriving at the Tree House, Donald sees Clayton about to open fire on Terk, and intervenes. Clayton claims he was saving her from a snake, but his actions make everyone suspicious. When Clayton wanders off on his own, he is attacked by Heartless. As Heartless arise due to Clayton's growing darkness and anger, the Powerwilds try to capture the gorillas, so Sora must defeat enemies in every area (except Hippo's Lagoon, Treetop, and Tunnel)) to save each gorilla to advance on. He disappears, leaving his pipe on a rock. Searching for him, Sora's party finds the pipe, only to be attacked by Sabor one last time. While Sora defeats Sabor, Jane and Terk are abducted by Heartless. They save them and together with Tarzan, the three battle Clayton (now transformed by darkness), and Stealth Sneak. They win Kerchak's trust by winning this battle and he throws Sora to the waterfall, where he closes the Keyhole. In addition, Donald and Sora reconcile their friendship by apologizing for their argument prior to their arrival. In the Camp, right outside the tent, there is a table with several objects on it. Among them is a teapot and a cup which bear an uncanny resemblance to Mrs. Potts and Chip, as was also seen in the movie. After completing the events that transpire within Deep Jungle, there is a cutscene which depicts a captured Princess of Heart before the Disney villains. If the player has already locked Wonderland, this is Alice, but if they have not, it is Snow White. This page was last edited on 19 April 2019, at 02:16.